Fun with Barnwood! The trend of popularity with barnwood home decor is booming! We’ve seen some beautiful uses of this classic material on so many shows and designer pics and galleries lately, the creativity is endless with this and we want to start doing more with it too! We’re doing our best to incorporate this beautiful, repurposed wood source into our current and future design pieces. As most of it is brittle and not ready to live outside anymore, we’ve converted most of our designs into interior home decor pieces. We’ve made some amazing creations out of barnwood this month and we want you to know what we’re offering now! We did a big accent wall in the front of our retail store, it looks amazing! We also have a huge supply of barnwood now if you’re looking for some to do your own home project, let us know for sure! We have many different styles and options available as well, we get a shipment in about once a month, so let us know what you’re looking for and we’ll do our best to source what you need and get you a good price as well! 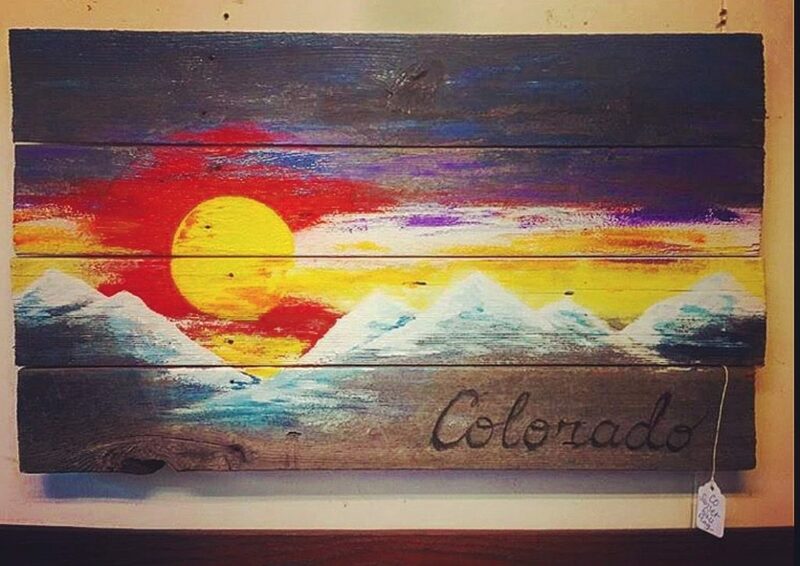 We also have small wall art pieces, 24″x14″ that we’re painting Colorado flag sunsets on now that are beautiful and very popular. They make great gifts, or accent wall pieces. We can custom make them in any size as well. We just did a custom oil painted barnwood sign that was 48″ x 30″ for a small business- Silver Sparrow beads in Colorado Springs that’s relocation from Manitou, Springs, CO to Old Colorado City, CO and is using it as their main sign in the front window of the store. Check them out, it looks beautiful! We also just started making white stained pieces into triangular mountain shapes out of barnwood for more original wall art, they’re beautiful, elegant and look great in any room! We can use barnwood for making bars, indoor benches, headboards, backsplash pieces, bathroom accent walls, man caves, kitchens, bedrooms, livingrooms, dining rooms or whatever project you’re working on. We had a pair of skis come in recently from Line skis that has a barnwood graphic on the tops of the skis. We featured those skis and several other matching pairs with wood based colors as the chair back, and then inlaid a piece of barnwood on the front board of the chair, and then down the sides and also the top surface of the cupholder as well. It turned out great and really looked amazing. We covered the barnwood with polyurethane to make sure it holds up with it’s new life, once again in the outdoors on this adirondack chair.